Does your child like puzzles? Here is something interesting for those little hands. Montessori inspired puzzles that cover some geography🌎! 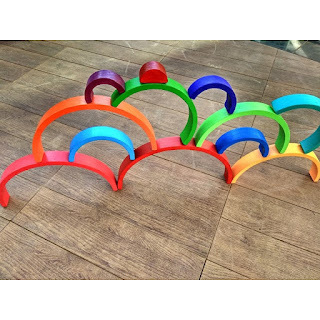 These wooden toys (knobbed puzzles) are made by artisans in India. 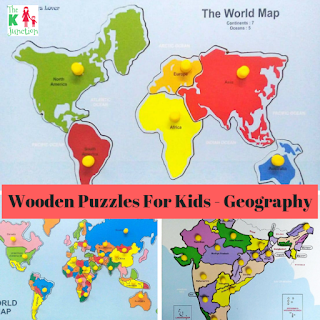 I came across these wooden knobbed puzzles of India, Continents 🌎🌏& Countries of the world by Stuti Gupta (Wooden Toy Lovers) . Sharing them here for your benefit and if you would like to order these for your child, here is a benefit for all you awesome members of this community. This is a token of love for being here! 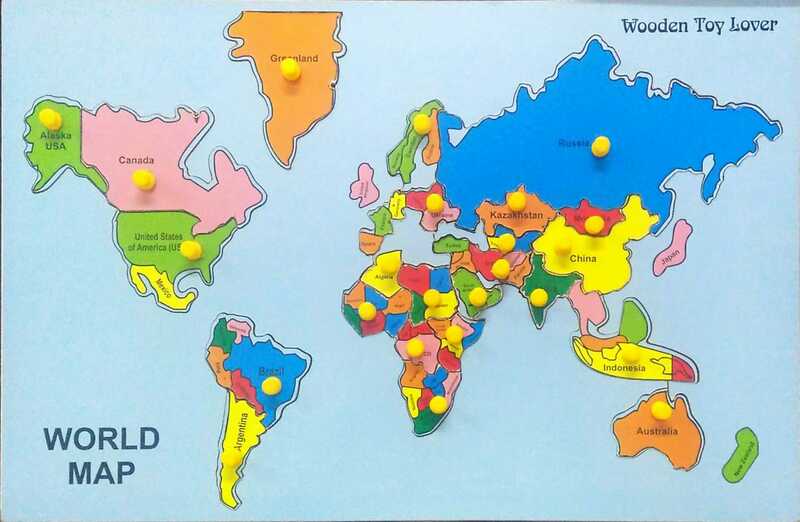 You can order these puzzles directly by contacting Stuti Gupta on whatsapp 📲 9811987124. Mention the discount code KJUNCTION & get an instant 👉 5% OFF on the prices mentioned above. Shipping is extra for all the puzzles. 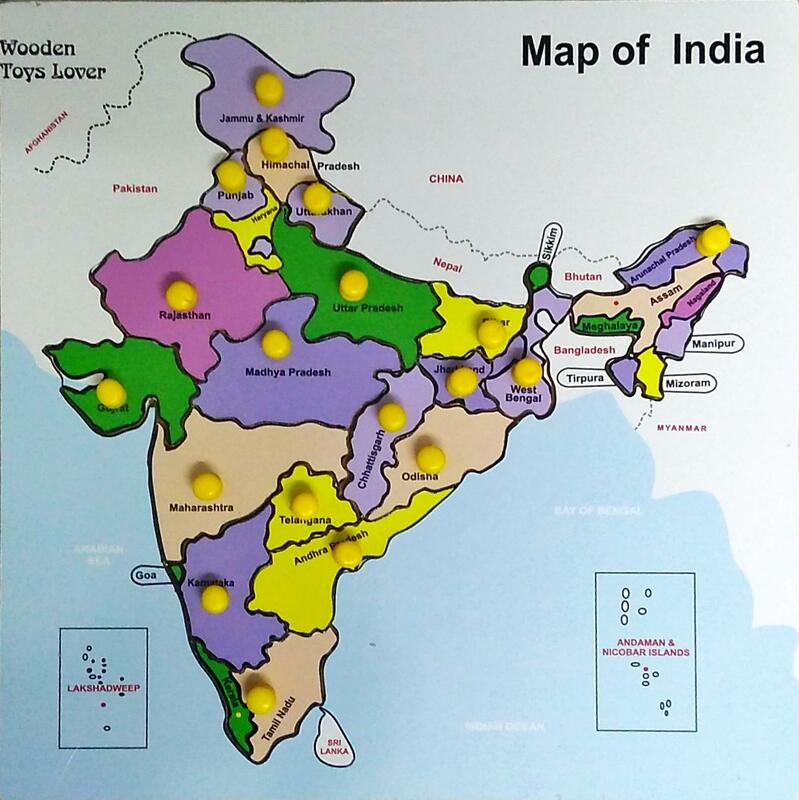 These are nice to introduce the concept, names & shapes of the continents, countries & states of India. I do not own them because I already have another version of such puzzles since a year now. But these wooden ones are a better eco-friendly alternative. It has knobs so it also helps in pincer grip. It is sturdier as compared to foam based puzzles of the same type available in the market. I would have preferred if the country & states shapes & sizes were more to scale but since this is just for representation purposes, it is not that big an issue. The child surely gets an idea about the stuff this puzzle intends to give. 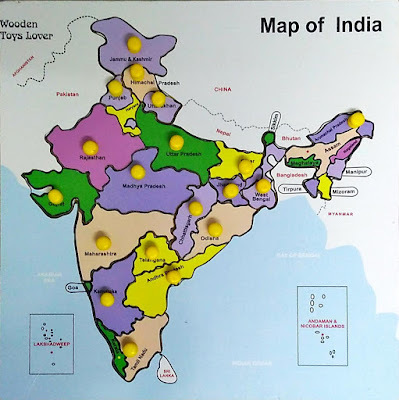 Some states in the India map will not have knobs because of their small size. 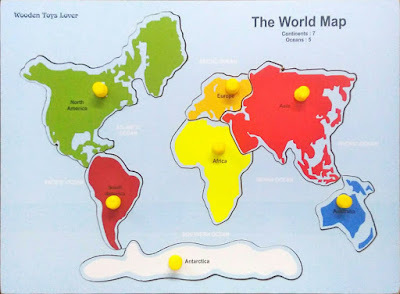 So those pieces wont be detachable from the map board. This is a known limitation because of small size of the state, but needs a gentle mention in this review. Overall, nice, engaging & educational puzzles. When not used with the puzzle board, for elder kids, the individual pieces of the puzzle can be used for tracing the countries or states shape & kids can color them. 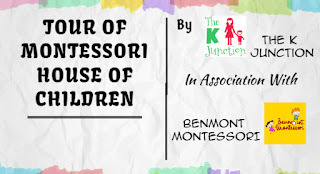 Do not forget to follow "The K Junction" on Facebook page & closed Facebook group, Twitter and Instagram for day to day updates that might not always find a place on this blog. Subscribe to our YouTube channel to know more about our early learning journey, DIY & Montessori & Waldorf inspired activities for kids, kids books & toys reviews and much more! Hope to see you around. Happy Parenting! Storytelling is an art & Indian mythological stories are a treasure. Instead of just telling the story verbally, this time try telling it with the help of props to your kids. Here is the birth story of Lord Ganesha, how he got elephant head. Check out my DIY storytelling setup with props in this article. This is how I narrated the birth story of Lord Ganpati this Ganesh Chaturthi to my 2 year old son using his toys and playset items. Let me know in the comments, how you found this storytelling setup! Being a parent myself, an early childhood educator & energy healer, I understand the anxiety that a parent faces in the parenting journey. Those never ending questions, doubts, issues in day to day life, we become clueless about every small thing related to our child. How to potty train, how to wean, how to handle tantrums, how to communicate, how to teach them table manners, and the list is endless. 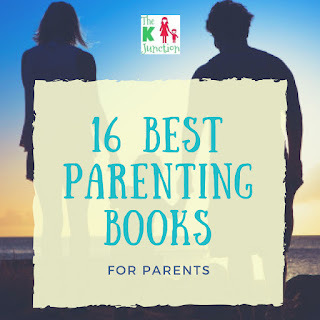 In this much requested post, I am sharing an exhaustive list of parenting books that will surely guide you through one of the most anxious as well as exciting & rewarding phase of your life - parenthood! Lets begin the list of some really awesome parenting books! A book by New York Times bestselling authors that teaches you how to effectively communicate with your child. The book also gives in tips and tricks to parents that teaches them to build a healthy relationship. This innovative parenting style recognizes the child's potential to spark a deep soul-searching leading to transformation in parents. Instead of being merely the receiver of the parents' psychological and spiritual legacy, children function as ushers of the parent's development. Once parents are learning alongside their children, power, control and dominance become an archaic language. Instead, mutual kinship and spiritual partnership are the focus of the parent-child journey. Conscious parenting is the new guideline that holds the best of both worlds: the familiarity of sure-shot methods and the necessity of modern, emerging ideas for a happy childhood. Equal parts practical and spiritual, this book is the right concoction of everything that spells successful parenting in the twenty-first century. A book that offers prompt solutions to parents to help their kid overcome sibling rivalry by examining various methods. Drawing upon the exploding research in this field as well as the stories of real children, What's Going On in There? is a lively and thought-provoking book that charts the brain's development from conception through the critical first five years. In examining the many factors that play crucial roles in that process, What's Going On in There? explores the evolution of the senses, motor skills, social and emotional behaviors, and mental functions such as attention, language, memory, reasoning, and intelligence. The authors explore the extent to which our childhood experiences shape the way we parent. Drawing on stunning new findings in neurobiology and attachment research, they explain how interpersonal relationships directly impact the development of the brain, and offer parents a step-by-step approach to forming a deeper understanding of their own life stories, which will help them raise compassionate and resilient children. The author stresses the tremendous importance of doing everything in the knowledge that children are citizens of both the spiritual and the earthly worlds. And, throughout these lectures, he continually returns to the practical value of Waldorf education. The authors offer a compelling indictment of the growing trend toward accelerated learning. It's a message that stressed-out parents are craving to hear: Letting tots learn through play is not only okay-it's better than drilling academics! This book bridges the gap between what scientists know and what parents practice. Through fascinating and funny stories, Medina, a developmental molecular biologist and dad, unravels how a child's brain develops -- and what you can do to optimize it. You will view your children--and how to raise them--in a whole new light. The author helps parents reclaim for their children the space and freedom that all kids need for their attention to deepen and their individuality to flourish. This book discusses healthy rhythms in both home and school, play and how it stimulates imagination, how to protect and enliven the child's twelve senses, creative discipline, creation of birthday stories and craft projects for the young child and much more. The author explores the reasons why a child refuses food, the pitfalls of growth charts, and the ways that growth and activity affect a child's caloric needs. He discusses how eating problems start and how they can be avoided. Toddler Calm is about gentle parenting. It will give you a proven and successful alternative approach to creating a calm and happy family. Are you a parent who would like to support your child’s development in the best possible way? Would you like access to a quick, easy technique to improve their behaviour? 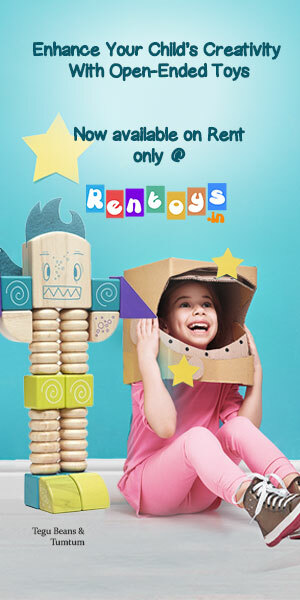 Build their self-esteem and help with lots of childhood issues? The Sleep Talk for children may be the answer. In this video below, I am going to talk very briefly about sleep talk. 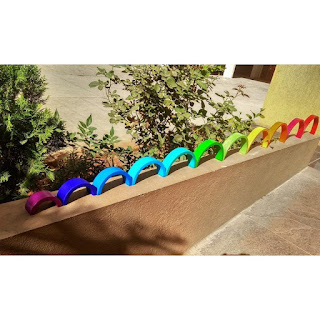 It is an awesome parenting tool that I have been using for my son since he was born. I have used it for potty training, behavioural issues, handling tantrums, separation anxiety, weaning breastfeeding, putting to sleep, building self esteem, eating issues and what not. This can be used for children till they are about 12 or 13 years. However magical it may seem, it has a strong backing of a reason why it works. But before we go on to why it works, let us first understand how it can be used. So how to do sleep talk. Watch this video below to understand. If you liked this video then you much check out this life-changing online workshop on Spiritual Parenting that will transform your idea about parenting & relationship with your child forever! 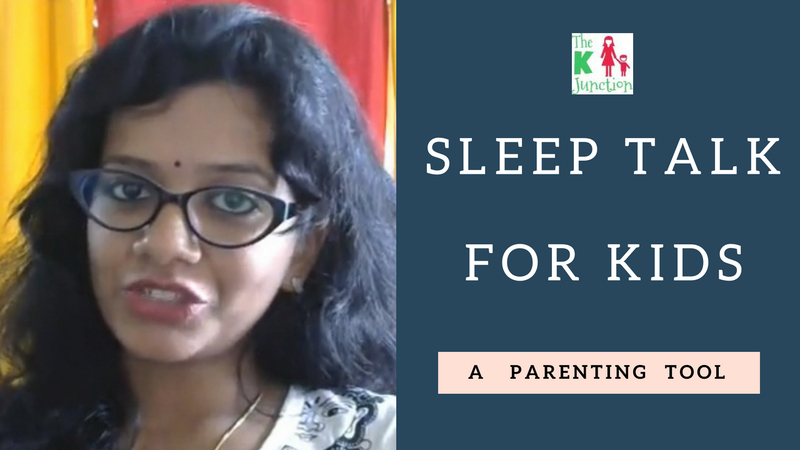 If you want any help in coming up with sleep talk affirmations for your child for a specific issue, you can reach out to us using THIS contact form & our team will help you arrange a one-on-one consultation with the expert. Please DO NOT expect answers to personal queries here. 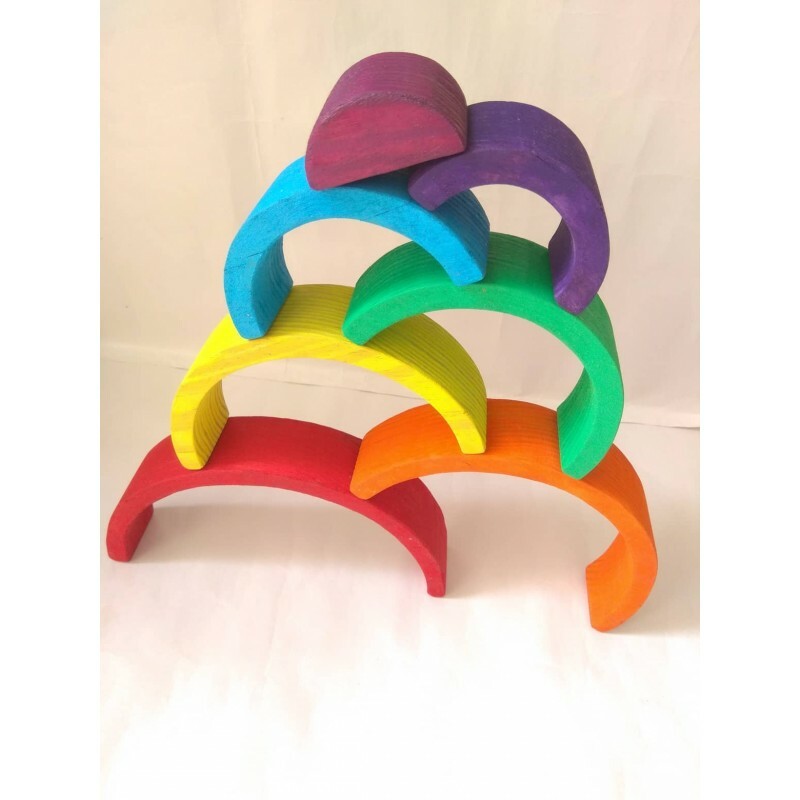 There are many versions of Waldorf inspired Rainbow Stackers (like Grimm's etc) available in the Indian & overseas market now but before you decide which brand to pick up, here are few pointers you should consider so that your child can make the most out of this versatile toy! Make sure the stackers are exact semi circles, i.e. full arch. To check that, just see the smallest piece of the stacker, does it look like an exact semi circle or close to 1/3rd of a circle? To make the most of this stacker toy, it NEEDS to be exact semi circle. Make sure the color of the pieces is not glaze finish and has enough friction to bear the weight while they are stacked. Make sure that the wood used is not too light (it happen in case of mdf wood), otherwise the stacking will not be neat & stable. 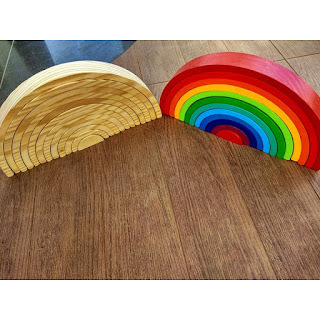 Make sure the wood used is not too heavy (some kinds of woods are heavier & denser), otherwise it will be uncomfortable for little hands to handle it. I hope these pointers are helpful to all. I find all these pointers fulfilled in these Rainbow Stackers by My Dream Shop owned by Surekha Jadhav. So sharing it here for your benefit. Check out My Dream Shop's 7 piece Rainbow Stacker HERE. Below are some inviting pics of the same. 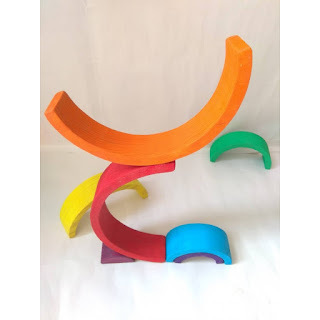 Check out My Dream Shop's 12 Piece Rainbow Stacker HERE. The shop also stocks natural (without color) version of these stackers. Check out all the items of My Dream Shop HERE. With monsoon comes the mosquito menaces and so are the diseases like Dengue, Malaria and chikungunya. Real fight for a parent is to protect children from these diseases and we all know the side effects of various mosquito repellents present in the market. 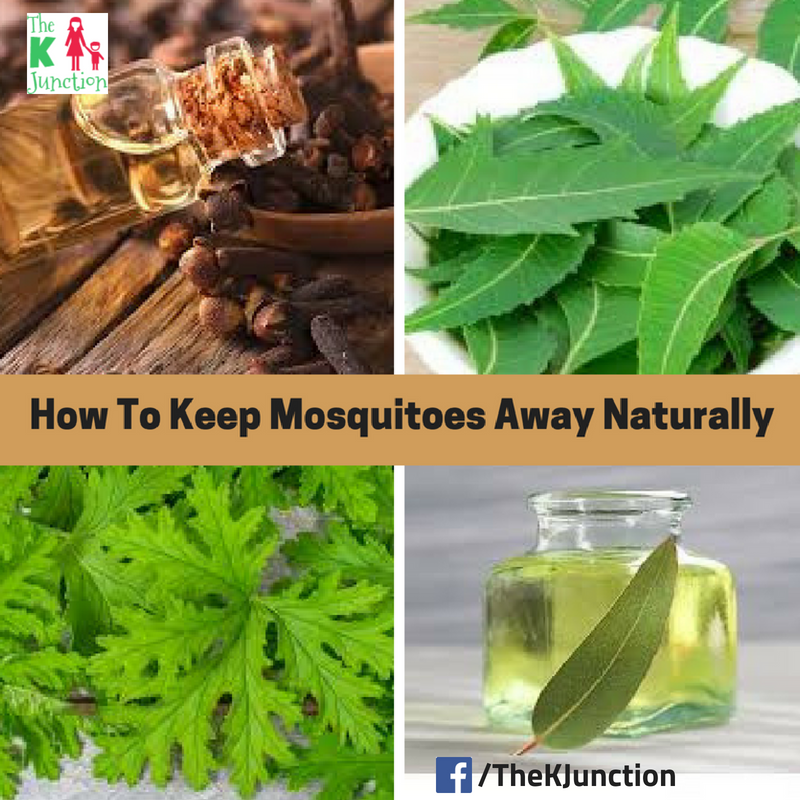 In this post, let us look at natural alternatives to keep off the mosquitoes. Here are some popular natural mosquito repellents DIY recipes that should drive the mosquitoes away. 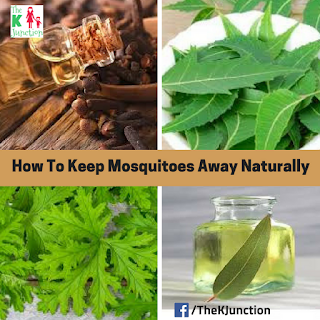 Neem oil is considered as one of very effective mosquito repellent. Neem oil is easily available at nearest chemist shops. You can dilute this oil with coconut oil and apply on body. This is a popular essential, it is derived from a species of lemon grass and the smell of it is researched to be quite offensive for the mosquitoes, especially the dengue-causing variety. Many top brands repellent cream has this citronella content. Clove is again a very common ingredient in Indian kitchen and also another very popular and easily-available oil, this too have insect repelling feature. If using on a small child, mix this oil with coconut oil and apply. A very well-documented mosquito repellent, OLE is known to have an effect as powerful as a chemical repellent. If you read the labels, you will find it listed as an ingredient in most natural insect repellents. If you wish to use it, try and procure the insect-repellent version of it and not the essential oil as the efficacy of the latter is not yet confirmed. These oils do not work for longer hours, most have an efficacy of maximum 2-3 hours. However, you can reapply these oils. If you do not have the time & patience to try out the above recipes. Here is a ready-made solution for everyone. I have been using these two all natural mosquito repellents and they work great for me & my family. You might want to check them out! Do share in comments if you have any tips or tricks to keep mosquito away naturally. The Very Hungry Caterpillar is one of the most illustrative and informative books for children between the age group of 1 to 5 years. The book is basically the story of a caterpillar dissecting the pangs and toils of its life. The language of the book is very simple. This has been especially done so that the children are encouraged to read the book themselves. With its extensive illustrations, the book also provides a lot of information to the children and at the same time persuades them to think and answer some questions; like the number of days in a week or naming food items or stating the stages of evolution of a caterpillar. The author has given away some really interesting facts in the book in an easy manner which is why the knowledge becomes readily available to the children and they rather take it as obvious facts. While doing so, however, the author has not indulged in scientific facts that become boring after a point and has also emphasized on the fictional things that might amuse the children. Furthermore, the book very accurately states the metamorphosis process which has been endorsed by the Royal Entomological Society. The Very Hungry Caterpillar is one of the best timeless classics for children because the book and the story was initially published in 1969, but over the course of 40 years, the book still hasn’t lost its charm and continues to mesmerize young readers from around the globe. The simple story of a caterpillar’s transformation into a beautiful butterfly has become widely popular because of its scientific approach. Eric Carle’s books have an uncommon place in everyone’s heart. The way he makes his representations makes them so bright and engaging all. This Very Hungry Caterpillar book has holes through its pages and it worked extremely well with kids as they like putting their fingers in things. It is a very cute charming tale about growing up – development of a caterpillar from egg to butterfly and in the meantime it’s very educational for younger children because the main character has to overcome his ravenous appetite, so ends up eating a lot. In this procedure youngsters can learn to count, explore different fruits, hues and find out about caterpillars transform into butterflies. It also gives a good introduction to days of the week and some food vocabulary. 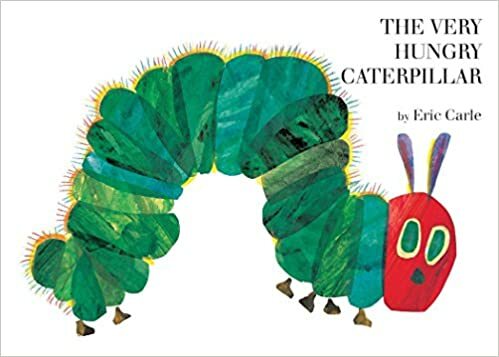 In this book we discover that caterpillars, similar to people, appreciate eating junk food and fall sick, so we can likewise make a point to kids about adhering to a good diet as the caterpillar feels better after eating leaves(good diet). Book Review by Vaishnavi Yelchur. Read all reviews by Vaishnavi HERE. 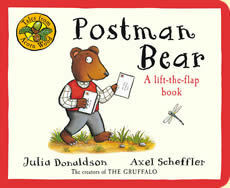 Read on this kids book review of the book Postman Bear from the celebrated author Julia Donaldson. ‘Postman Bear’ is a dazzling story of woodland friends receiving a very special letter. This story with a well-known setting utilizes rhyme to superbly add fluency and is based around a little Bear in bright red midsection coat composing and delivering letters to three of his companions. 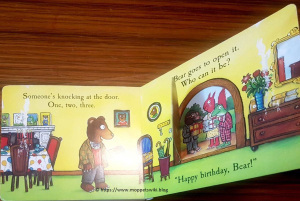 Set in a woodland, the pursuer is able to follow the Bear as he goes to different areas to post these letters and kids are able to count and ensure that each one is delivered, as well as encouraged to make guesses as to who is behind each front door and eventually what exactly could be written in the letters. Toward the finish of the book the Bear prepares for the birthday party heating a cake lastly respects all his friends at the entryway. 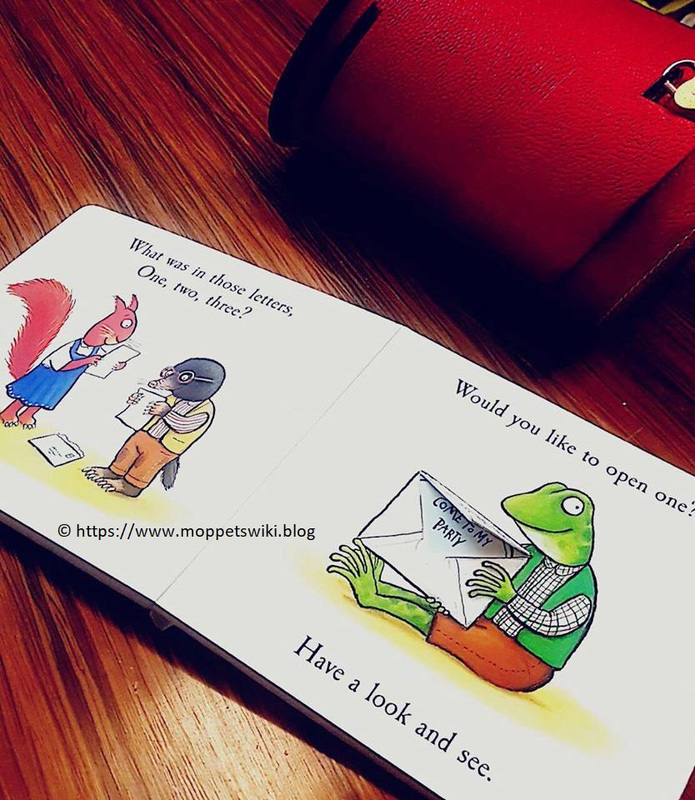 The story offers a few open doors for youngsters to conclude, construe and translate information both with the inquiries asked inside the book, for example, ‘Who’s behind this entryway?’ and the splendid illustrations in this story additionally gives much possibility for guardians to make inquiries and incite kids to expand upon such abilities fundamental to reading. 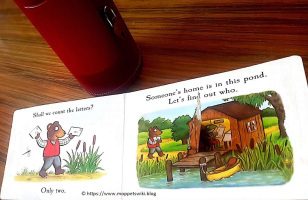 On the whole ‘Postman Bear’ is a brilliant read for youthful readers to expand upon their phonics abilities.The magnificent illustrations using interactive flaps to reveal extra information drive fun, surprise and fabricate early perception and comprehension for moppets. Let us revisit this very old and popular form of meditation that will give you healing and relaxation - CLOUD MEDITATION. This is a great tool to develop mindfulness and it can be practiced by kids and adults alike anywhere anytime, provided you can spot a cloud in the sky. With monsoon everywhere in the country, lets practice this meditation when it is cloudy. 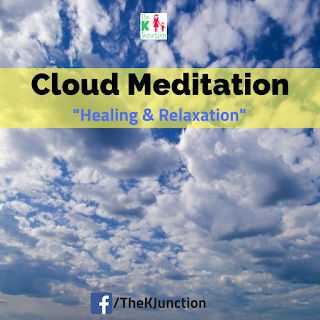 Its a simple meditation popularly known as “Cloud Meditation”. You can do this even when it’s raining. The first thing you need to do is find a quiet place outside, away from people, where you will not be disturbed by anything. This could be in a park, on a hill, or at the beach. If this is not possible, sit on your porch or by a window, where you can see the sky. If you are outside, either sit down on a rock or bench, or lie down on the grass. Ensure to look at a cloud in the opposite direction of the sun, so that you don’t look at the sun. Now slowly take few deep breaths, and then relax your body. Look at the sky for some time, choose a cloud, and fix your attention on it. Notice the color of the cloud, its shape and size. Watch the cloud, and follow it movement as it drifts in the sky. Watch how the cloud changes its shape or dissolves in the sky. Keep watching the cloud calmly, while disregarding the other clouds. Just watch the cloud, without thinking about it, analyzing or commenting about what is happening. Whenever you discover that your attention has wandered away, bring it back to the cloud. Duration for this meditation :10 minutes. It strengthens the concentration ability of mind, improves control of the attention, and increases calmness. Let me know in the comments below your experience with this meditation. Announcing the 10 days online Whatsapp Workshop for everyone - SELF HEALING & CHAKRA BALANCING. 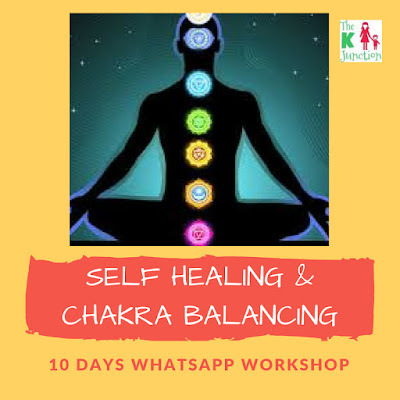 I would like to invite you to this transformative whatsapp workshop (so you can be anywhere in the world to attend this) where I will teach you about your energy centres called Chakras. I will tell you how to energize, strengthen and balance them, one by one. In this workshop, you will get to understand about 7 chakras, their various aspects, how they govern our physical & emotional lives, identify the imbalances in your chakras, self heal your chakras, do chakra balancing & see a shift in your overall energy and physical, mental & emotional being. ⚠️ Suitable for beginners (little or no experience in meditation) and advanced. Click HERE for details, testimonials & registration! My name is Kuhoo, I am a singer, author, early childhood educator, Montessorian, healer, mommy blogger & once-upon-a-time-an-IITian! I write about my parenting & homeschooling journey with my son, early childhood education, Montessori, Waldorf, music, healing and other creative stuff. Don't Miss A Post - Subscribe!